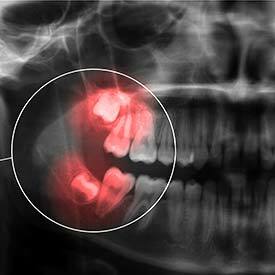 For most people, the thought of having their wisdom teeth extracted induces fear and anxiety. Dr. Struan Vaughan and Dr. Earl Pierson are pleased to offer Brooks Wisdom Teeth Extraction at Parkview Dental for people with a fear of wisdom teeth extraction. Dr. Struan Vaughan and Dr. Earl Pierson will complete a thorough examination of your mouth, including x-rays that will help diagnose the type of wisdom teeth removal you require. Regular dental exams also help you keep your gums and teeth healthy, allowing us to identify any potential concerns to prevent costly dental procedures down the road. Your wisdom teeth extractions will take place in our Brooks Dental Office, and the length of your procedure will depend on your specific needs. We help you feel comfortable throughout your appointment and will provide you with detailed instructions on how to care for your mouth after your wisdom teeth extractions. For all of your wisdom teeth extraction needs in Brooks, we welcome you to book an appointment for a consultation today. We can also discuss your wisdom teeth options with you at your next hygiene and check-up appointment — just ask! We look forward to hearing from you soon.